This file contains basic map-related structures and macros. Gets the layer face of specified square. Not multitile aware. Definition at line 184 of file map.h. Referenced by draw_client_map2(), magic_mapping_mark(), and magic_mapping_mark_recursive(). Returns the layers array so update_position can just copy the entire array over. Definition at line 189 of file map.h. Gets map flags. Not multitile aware. Definition at line 161 of file map.h. Referenced by find_closest_monster(), find_monster_in_room_recursive(), object_update(), and update_position(). Gets map light. Not multitile aware. Definition at line 165 of file map.h. Referenced by expand_lighted_sight(), and monster_stand_in_light(). Gets the blocking state of a square. Not multitile aware. Definition at line 192 of file map.h. Referenced by alchemy(), animate_weapon(), attempt_jump(), blocked_link(), cast_cause_disease(), cast_cone(), cast_create_obj(), cast_earth_to_dust(), cast_light(), cast_polymorph(), check_bullet(), common_process_projectile(), create_bomb(), dimension_door(), do_throw(), fire_arch_from_position(), fire_bolt(), fire_bow(), forklightning(), get_pointed_target(), magic_wall(), map_find_dir(), monster_use_bow(), move_aura(), move_ball_spell(), move_bolt(), move_bullet(), move_missile(), ob_blocked(), object_check_move_on(), object_free2(), object_update(), ok_to_put_more(), path_to_player(), pets_move(), pick_arrow_target(), roll_ob(), skill_attack(), stand_near_hostile(), steal(), surround_flag3(), teleport(), and wall_blocked(). Gets the move_off state of a square. Not multitile aware. Definition at line 207 of file map.h. Gets the move_on state of a square. Not multitile aware. Definition at line 202 of file map.h. Referenced by object_check_move_on(), and object_update(). Gets the slowing state of a square. Not multitile aware. Definition at line 197 of file map.h. Gets the bottom object on a map. Not multitile aware. Definition at line 172 of file map.h. Referenced by apply_auto_fix(), apply_builder_floor(), apply_builder_item(), apply_builder_remove(), apply_map_builder(), cast_polymorph(), cfapi_map_get_object_at(), check_hp(), check_spell_knockback(), do_harvest(), do_mood_floor(), esrv_draw_look(), find_target_for_friendly_spell(), free_all_objects(), is_legal_2ways_exit(), look_at(), make_map_floor(), map_find_by_flag(), move_detector(), move_marker(), move_player_attack(), move_to(), object_check_move_on(), object_insert_in_map(), object_remove(), pick_lock(), pick_random_object(), put_floor(), remove_monsters(), shop_inventory_type_apply(), spell_find_dir(), START_TEST(), steal(), and teardown(). Definition at line 168 of file map.h. Gets the top object on a map. Not multitile aware. Definition at line 174 of file map.h. Referenced by identify(), and object_insert_in_map(). Definition at line 25 of file map.h. Referenced by draw_magic_map(), magic_mapping_mark(), and magic_mapping_mark_recursive(). Definition at line 24 of file map.h. Map darkness used to enforce the MAX_DARKNESS value. but IMO, if it is beyond max value, that should be fixed on the map or in the code. Definition at line 75 of file map.h. Referenced by expand_lighted_sight(), expand_sight(), object_insert_in_map(), and object_insert_in_ob(). Definition at line 65 of file map.h. Referenced by calculate_difficulty(), and mapfile_load(). Default X coordinate for map enter. Definition at line 85 of file map.h. Referenced by current_map_info(), dump_map(), enter_exit(), enter_map(), enter_player_maplevel(), enter_random_map(), enter_random_template_map(), get_linked_map(), and place_exits(). Default Y coordinate for map enter. Definition at line 87 of file map.h. Referenced by add_exits_to_map(), adjacent_map(), apply_auto_fix(), apply_map_builder(), calculate_difficulty(), command_style_map_info(), current_map_info(), decay_objects(), delete_unique_items(), do_auto_apply(), do_exit_map(), dump_map(), enter_map(), find_spot_for_submap(), fix_walls(), free_all_objects(), generate_monster(), get_linked_map(), get_map_from_coord(), include_map_in_map(), link_multipart_objects(), load_objects(), object_find_multi_free_spot_around(), object_update(), out_of_map(), pick_random_object(), place_fountain_with_specials(), place_monsters(), place_special_exit(), place_specials_in_map(), CREMapInformationManager::process(), process_map(), save_objects(), shop_inventory_type_apply(), teardown(), and update_all_los(). Definition at line 32 of file map.h. Referenced by check_space_for_heads(), draw_client_map2(), magic_mapping_mark(), magic_mapping_mark_recursive(), map2_add_ob(), and update_position(). Definition at line 89 of file map.h. Definition at line 68 of file map.h. 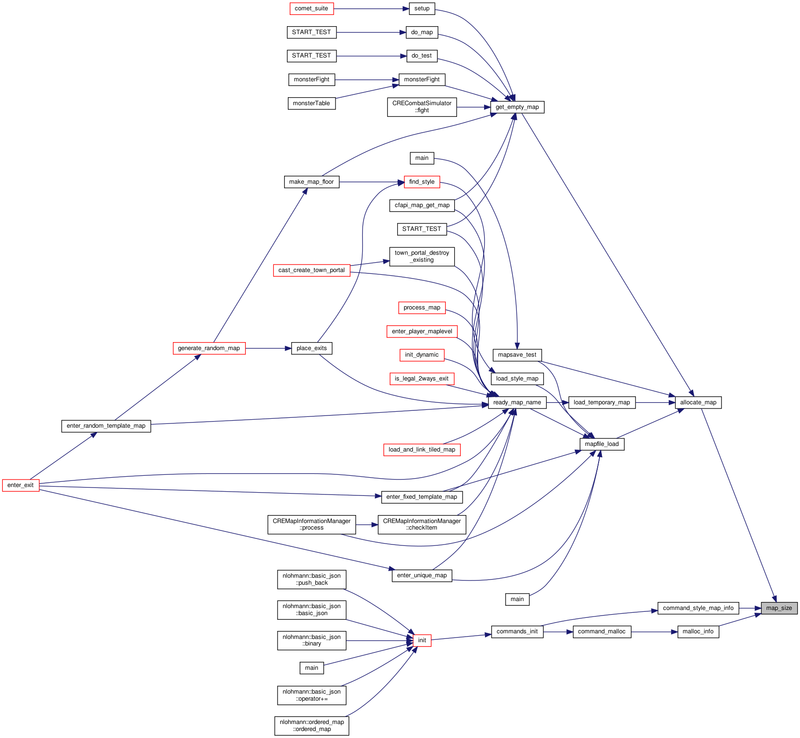 Referenced by get_linked_map(), and set_map_reset_time(). Convenient function - total number of spaces is used in many places. Definition at line 82 of file map.h. Definition at line 67 of file map.h. Definition at line 66 of file map.h. Referenced by apply_savebed(), command_kick2(), current_map_info(), get_linked_map(), leave(), and set_map_timeout(). Definition at line 59 of file map.h. Referenced by create_player_cmd(), and send_map_info(). Definition at line 58 of file map.h. Definition at line 57 of file map.h. Definition at line 62 of file map.h. Referenced by map_info(), and set_map_reset_time(). Definition at line 78 of file map.h. Checks if a square is out of the map. You should really know what you are doing before using this - you should almost always be using out_of_map() instead, which takes into account map tiling. Definition at line 217 of file map.h. Referenced by apply_builder_floor(), apply_builder_wall(), blocked_link(), get_map_from_coord(), monster_compute_path(), move_player_attack(), object_insert_in_map(), reflwall(), teleport(), and wall_blocked(). Sets the layer face of specified square. Not multitile aware. Definition at line 182 of file map.h. Sets map flags. Not multitile aware. Definition at line 163 of file map.h. Referenced by cfapi_object_set_property(), do_turn(), object_insert_in_ob(), object_remove(), object_update(), and update_position(). Sets map light. Not multitile aware. Definition at line 167 of file map.h. Sets the blocking state of a square. Not multitile aware. Definition at line 194 of file map.h. Sets the move_off state of a square. Not multitile aware. Definition at line 209 of file map.h. Sets the move_on state of a square. Not multitile aware. Definition at line 204 of file map.h. Sets the slowing state of a square. Not multitile aware. Definition at line 199 of file map.h. Sets the bottom object on a map. Not multitile aware. Definition at line 177 of file map.h. Referenced by object_insert_in_map(), and object_remove(). Definition at line 169 of file map.h. Sets the top object on a map. Not multitile aware. Definition at line 179 of file map.h. This structure contains all information related to one map square. Shop-related information for a map. This is one item type the shop will deal in, and the price-chance.